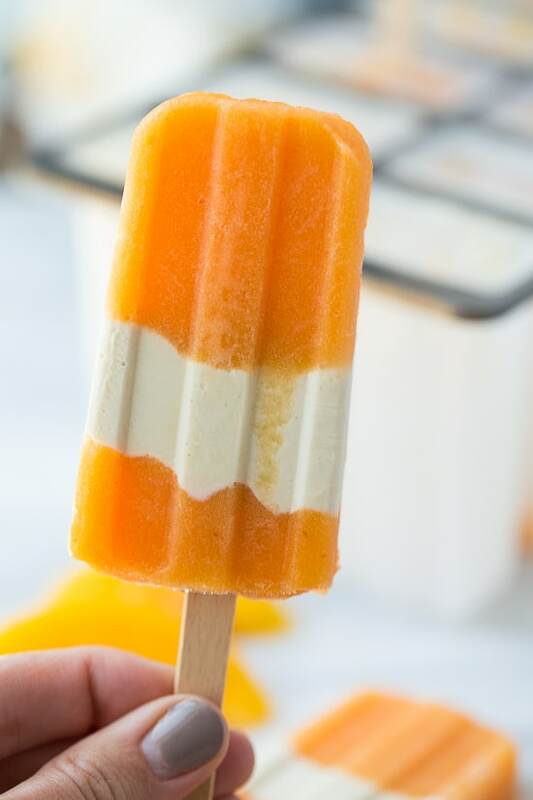 3-Ingredient Healthy Peach Creamsicles! So easy to make and perfect for a healthy summer treat! Making homemade popsicles has become one my son and I’s very favorite things to do in the summer. He is crazy about popsicles (aka sickle pops) and I love having a healthy treat on hand for him and his friends when they’ve been playing outside on a hot day. 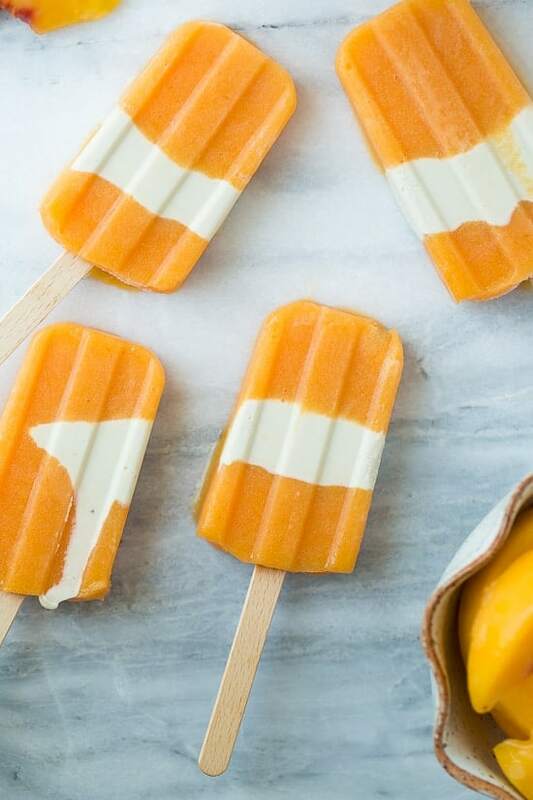 We’ve made a lot of different kinds of popsicles between this summer and last and our favorites are healthy homemade fudgesicles, watermelon lime pops, and these peach creamsicles. 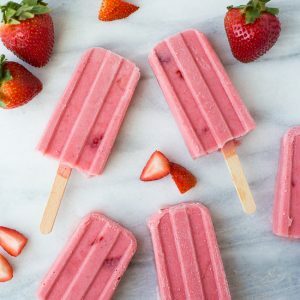 I also love these popsicles myself for a healthy evening treat! These couldn’t be easier to make. They have 3 ingredients and can be whipped together in less than 15 minutes. 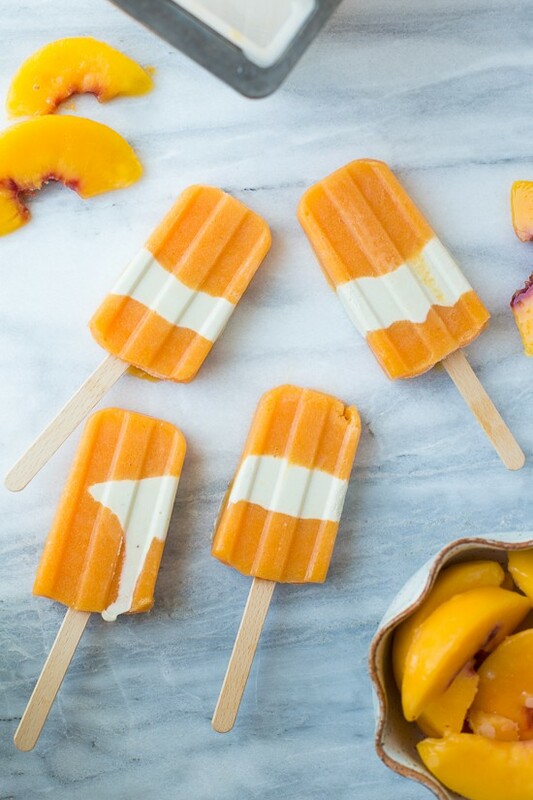 These popsicles work great with fresh or frozen peaches. The layer of cashew cream in the middle makes them such a treat! I like using this popsicle mold. Once the popsicles are frozen, I run a little warm water on the bottom to get them out. Then I transfer the popsicles to a ziploc bag for longer storage. They are great to have on hand for hot summer days! Either fresh or frozen peaches will work great here. Use maple syrup instead of honey to make these vegan. It is really important the cashews are soaked for this recipe. Sometimes to speed up the soaking process I pour boiling water over the cashews and let them sit for 30 minutes-1 hour. Place the peaches in the blender. Add 2-3 tablespoons honey and puree until smooth. Pour into a glass measuring cup. 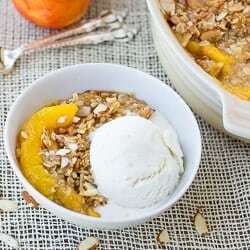 , layer the peach mixture and the cashew cream mixture until the molds are 3/4 of the way full. Place the lid on the mold and add the sticks. Freeze for at least 6 hours, until solid. To get the popsicles out of the mold you may need to run warm water on the bottom. You can then remove the popsicles and store them in a ziploc bag for longer storage. They will keep for 1-2 weeks. Enjoy! MAKE IT NUT-FREE: Use coconut milk mixed with honey in place of the cashew cream. I can’t believe these are dairy free! Three cheers for peach creamsicles!! So perfect for summer! Kids of all ages love these. 3 ingredients, healthy and a fun summer treat? You beat you can count me in!